O God, who made the Abbot Saint Benedict an outstanding master in the school of divine service, grant, we pray, that, putting nothing before love of you, we may hasten with a loving heart in the way of your commands. Through our Lord Jesus Christ, your Son, who lives and reigns with you in the unity of the Holy Spirit, one God, for ever and ever. Benedictine Benedictions | Br. Timothy Danaher O.P. Symbols: Bell; broken cup; broken cup and serpent representing poison; broken utensil; bush; crosier; man in a Benedictine cowl holding Benedict's rule or a rod of discipline; raven. Purchase a copy of The Rule of Saint Benedict (Vintage Spiritual Classics) and/or St. Benedict and St. Therese: The Little Rule & the Little Way, Citadel of God: A Novel About Saint Benedict, Listen My Son: St. Benedict for Fathers. 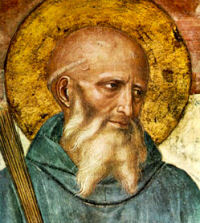 Try St. Benedict: Hero of the Hills and The Holy Twins for the children. Monasteries kept bees to provide honey for sweetening and mead made from fermented honey — wax was in great demand for candles. Honey and mead were used to make herbal remedies more palatable! Although it is not officially marked in the Roman Ritual,, there is a remote connection with St. Benedict and the Blessing of Bees. Read Address on Bees by Pius XII. After Benedict had been living as a hermit for several years a religious community came to him after the death of their abbot and asked Benedict to take over. Some of the monks didn't like this plan and the rigor of his rule and attempted to kill him with poisoned bread and wine. When St. Benedict made the sign of the Cross over the cup of wine and the bread, the cup holding the wine shattered (some versions say it spilled) and some versions indicate a raven carried off the bread. This website gives an explanation of the St. Benedict Medal and the meaning of the symbols on it which includes the poisoned cup and the raven. And for more about the medal read The Medal of St. Benedict by Fr. Bernardine Patterson OSB. From Catholic Culture's Library: Rule of St. Benedict, Fulgens Radiatur (On St. Benedict) Pius XII, Order of St. Benedict, The Holy Father's Message of July 7, 1999 sent to the Abbot of Subiaco for the celebration of the 1,500th anniversary of the foundation of St. Benedict's first monastery there. The Holy See remained vacant for three days, then Pius, an Italian from Aquileia, stepped into the shoes of the Fisherman. His father's name was Rufinus, and his brother Hermas was a former slave and the author of the early Christian document, The Shepherd, whose contents would seem to indicate that a monarchial episcopate was now recognized in Rome. Pius was preoccupied with the challenge of the Gnostic leaders who by this time had been joined by Marcion of Pontus, and who continued to disseminate their system of belief widely. In July of 144, Pius presided over the assembly of presbyters that excommunicated Marcion from the orthodox community. But just as tormented as Pius was with the Gnostics, he was comforted in his friendship with Justin Martyr, that tremendous defender of Christ's doctrines, who now resided in Rome. A converted pagan, Justin sought the truth and through various schools of philosophy found it in Christianity. An early source credits Pius with the decree that all heretics willing to repent should be received and baptized. Tradition holds that he died a martyr and was buried on Vatican Hill. Want your high schoolers to learn more about the Popes and the history of the Church? Order this textbook, The Story of the Church - Her Founding, Mission and Progress. A Textbook in Church History.